Korean media/fans mesmerized by "Spiderman Paul"
Doha: India’s never-say-die attitude has been praised by the Korean media despite the Bhangra Boys’ 4-1 defeat at the hands of the Taeguk Warriors on Tuesday. Ji Dong-won scored twice as the Koreans sealed their place in the quarter-finals, while Koo Ja-cheol and substitute Son Heung-min also got on the scoresheet for the Taeguk Warriors. Sunil Chhetri converted a 12th-minute penalty for Bob Houghton's men. 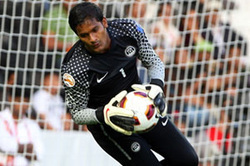 The ‘Seoul’ newspaper praised Indian goalkeeper Subrata Paul in an article headlined ‘Indian team GK, 16 times super-save! Who is this guy?’ and said that the custodian’s heroics had impressed Korean fans.Korea had 38 shots in total, 20 of them on goal, out of which Paul saved 16. ’My Daily’, another Korean newspaper, said Paul was the “real MVP” for Korean fans after billing him as the ‘Spiderman’. Another newspaper ‘Osen’ said India’s dream was to bring back the honour of the sixties when the Bhangra Boys were one of the dominant teams in the continent.The newspaper made a mention of the support India received at the stadium, saying that a lot of Indian fans had come to cheer the team.